Elephants are the only remaining members of the Proboscidea order of mammals. The order included the extinct wooly mammoth and American mastodon. Elephants are a “keystone species.” If a keystone species disappears through extinction or removal, the entire ecosystem would change drastically. Other species rely on the keystone species for survival. Among Asian elephants (Elephas Maximus), there are three subspecies: Indian, Sri Lankan, and Sumatran. These are distinguished by physical traits related to their geographic location. African savannah elephants (Loxodonta Africana) live in the grasslands of sub-Saharan Africa. African forest elephant (Loxodonta Cyclotis) live in the Congo River Basin in western central Africa. Asian elephants live throughout southeastern Asia, from as far west as India to as far east as the Indonesian islands. There are several anatomical and behavioral differences between the different species. Most noticeable is the difference in ears. African savanna elephants have large ears shaped much like the continent of Africa. African forest elephants’ ears are more oval shaped. Asians, who live in cooler forest areas, have smaller ears. Asian elephants also have rounded backs and relatively smooth skin while African elephants display a sway back and very wrinkled skin. Elephants are hypsodonts, with continually growing teeth. African elephants of both sexes generally (but not always) grow long incisor teeth called tusks. Among Asian elephants, only males exhibit tusks, and not all males have them. Tusks are modified, elongated incisors, and are therefore essentially no different from other teeth, continuously growing throughout an elephant’s life. It is common for elephants in the wild and in captivity to periodically chip distal portions of their tusks as they engage in natural foraging and social behaviors. Elephants in captivity that do not have the opportunity to engage in natural foraging and social behaviors due to limited habitat access and small enclosure size frequently require routine tusk trims in order to prevent overgrowth. Approximately 1/3 of a tusk is hidden from view, embedded deep in an elephant’s head. This portion of the tusk contains a core pulp cavity that contains tissue, blood, and nerves. The approximately 2/3 portion of the tusk that is visible is made of dentine with an outer layer of enamel. The average size and length of tusks have decreased over time, believed to be a side effect of selective hunting of bull elephants with larger tusks. Therefore, the inherited genetics for large tusks is becoming increasingly rare. Tusks are used for a variety of tasks in wild elephants. This includes foraging, digging, moving objects, stripping bark, and as weapons of protection. Evidence suggests that some elephants may prefer one tusk over the other, similar to handedness in humans. These “fingers” are very sensitive and make it possible for elephants to pick up very small objects. Elephants have more than 100,000 muscles in the trunk making it very flexible and strong enough to lift trees. All elephant species are herbivores, consuming only plant material. The elephants of Africa are browsers, and eat mostly grasses, turning to leaves, twigs, bark, flowers, and fruits when the grasses are not available. Asians are grazers and consume a similar range of plants, including large amounts of bamboo. All elephants are herd animals with very definite social structure. Herds are led by a matriarch, usually the oldest female, and are made up of daughters, sisters and their offspring. Male elephants stay with the herd through adolescence and then move away as they grow older. Male elephants often stay independent, but sometimes band together in bachelor pods. African savannah elephants can live in very large herds consisting of anywhere from 20 to 70 individuals, while the African forest elephants like the Asian elephants generally live in smaller herds. Elephants are highly intelligent animals whose continued existence is threatened. Loss of habitat, human-elephant conflict, and poaching for ivory and bushmeat are great threats to elephant populations. As of 2013, the Asian elephant population had experienced a 90 percent decline in the past 100 years and some experts suggest 95 percent of their original habitat has been lost over the same period. Estimates vary, but most agree that there has been a 75 percent decline in the elephant population in Africa. Today there are thought to be between 300,000 and 500,000 wild elephants in Africa and less than 60,000 wild elephants in Asia. Asian elephants are recognized as an endangered species. African elephants are recognized as threatened. Since the third millennium BC, elephants have been held in captivity. They have been used as beasts of burden, tools of war, and objects of interest and curiosity. In 1796, an American merchant imported a young female Asian elephant for exhibit, the first in North America. Throughout the 1800s, the demand for elephants in exhibits and circuses increased significantly. Young elephants were being captured from the wild at an early age, separated from their family herds, and sold to a life of performance, travel, confined spaces, and exhibition. By the late 20th century, research and observation led many to conclude that elephants are highly intelligent and emotionally complex animals whose needs are difficult to meet in captivity. In 1995, The Elephant Sanctuary in Tennessee was founded as a refuge where captive elephants could safely live our their lives in a natural habitat setting in the company of other elephants. There are more than 100,000 muscle units in an elephant’s trunk, making it sensitive enough to pick up objects as small as a penny and strong enough to lift whole trees. An elephants trunk is the fusion of its upper lip and nose, and is incredibly versatile serving as a nose, an arm, a hand, a voice, and much more. Elephants favor either their left or right tusk, just as people favor one hand over the other. 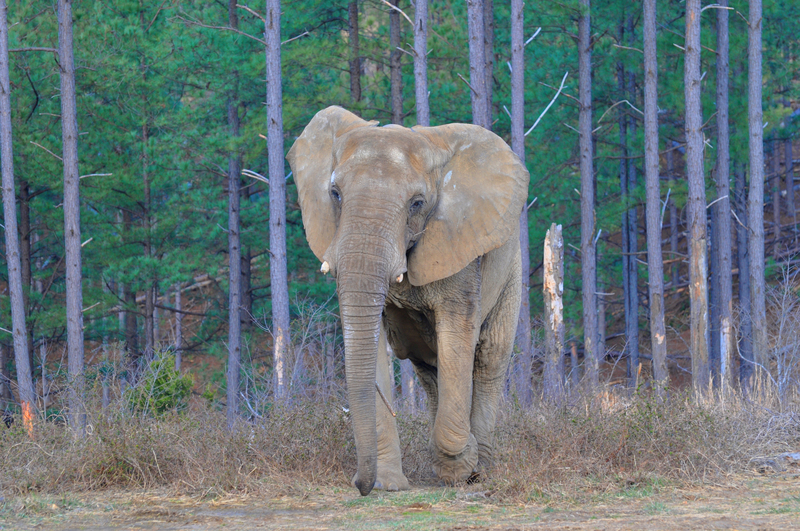 Tange is often seen carrying hay with her right tusk. Asian elephants are more closely related to the extinct wooly mammoth than they are to the African elephant. Mastodons and elephants split about 25 million years ago, while mammoths split from the African elephant 7 million years ago and the Asian elephant 2.5 - 5.2 million year ago. Baby elephants weigh approximately 200 pounds when born and the gestation period in elephants is almost two years. Elephants are highly social animals that form close bonds and family units. In the wild, family herds follow seasonal migration routes, led by a matriarch with decades of ecological knowledge about droughts, predation, and other threats. Loss of habitat, human-elephant conflict, and poaching for ivory and bushmeat are great threats to elephant populations. As of 2013, there has been an estimated 90 percent decline in the Asian elephant population and a 75 percent decline in the African elephant population over the last 100 years. People can and must make a difference in protecting elephants in the wild.